Infused with a warm, cottage style this poster bed is guaranteed to ease your son or daughter into a sound sleep. Its head and footboard are detailed with louvre panels for a light, airy feel, while a post at each corner is accented with decorative finials and tapered feet. The focal point of your child's bedroom, you can't go wrong with this warm and welcoming poster bed. This bed is available in twin and full sizes. 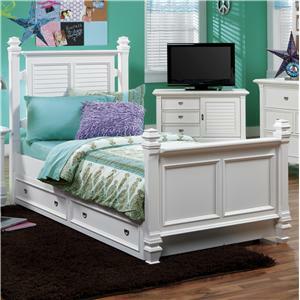 The Belmar Youth Twin Poster Bed with Louvre Panel Detail by Holland House at Miskelly Furniture in the Jackson, Pearl, Madison, Ridgeland, Flowood Mississippi area. Product availability may vary. Contact us for the most current availability on this product. Finish & Paint Options Available in 5 accent colors as shown. Drawer Suspension Wood-on-wood drawer guides. Urban cottage style comes together with the Belmar youth bedroom group. Built with hardwood solids and veneers, this crafty collection features louvre panel detail, tapered feet and edges, and small metal hardware for a warm and welcoming design. Your child will love the versatile storage and display space found in each piece - just what she needs for making her bedroom her own. From underbed trundles to bookcase bed storage, and even a compact media chest, the Belmar collection is creative in style and function. Choose from 5 distinct finishes to create a colorful ensemble your child will love. (Bookcase poster bed not shown). The Belmar Youth collection is a great option if you are looking for Cottage furniture in the Jackson, Pearl, Madison, Ridgeland, Flowood Mississippi area. Browse other items in the Belmar Youth collection from Miskelly Furniture in the Jackson, Pearl, Madison, Ridgeland, Flowood Mississippi area.